Producer: Cormorant Productions and Films, Ltd.
From the perspective of several persons diagnosed with various forms of dementia, this DVD takes an honest look at the highs and lows of living with dementia–with the emphasis on living. 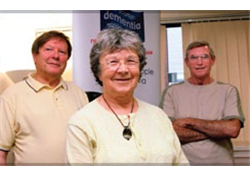 This inside look at dementia documents the impact of the emotional, physical, and cognitive changes that persons with dementia often experience, along with, ways they have found to cope and adjust to their altered lifestyles. It also offers valuable, sensitizing insights on what medical professionals can do to improve patient/family understanding when delivering a diagnosis of Alzheimer’s, and how communities can become more “dementia-friendly”.